Before I begin to explain my journey from St. Louis, Missouri to Madison, Wisconsin, I would like to tell you a little about myself. I am a graduate student at Boston University School of Medicine in the Department of Anatomy and Neurobiology (finishing up this year – fingers crossed! ), and I am conducting my thesis work in the laboratory of Dr. Rudy Tanzi in the Genetics and Aging Research Unit at Massachusetts General Hospital. On a personal note, my mother started showing symptoms of Alzheimer’s disease at the age of 56, when I was 21 years old. 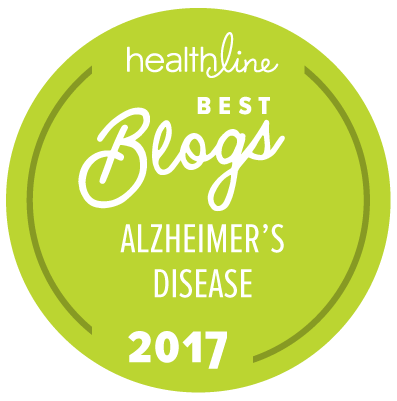 In November 2006, she was officially diagnosed with the disease at the age of 60, and at that point I became an Alzheimer’s caregiver in addition to Alzheimer’s researcher. Over the past few years I have witnessed my mother’s gradual mental decline, to a point where she is unable to recognize me anymore. Moreover, the effect my mother’s decline has had on my father, her primary caregiver, is utterly devastating. I return home to Rhode Island frequently to relieve my father of his caregiving duties, and these trips are generally filled with exhaustion, frustration and sorrow. I rode a total of 350 miles with my parents in mind the entire time. Many people commented that I must be so brave to commit to so many miles. In my mind there is nothing more terrifying than Alzheimer’s disease, and I could only hope to be as brave as my mother and father, who have the courage to face it every single day. After filling up on Mexican food and saying farewell to Team Boston Bikers who rode with me from St. Louis to Springfield, I met Dr. Rong Wong of Mount Sinai School of Medicine, who would be biking with me for the next three days all the way to Madison, WI. The following morning at breakfast my second meeting with Rong was quite interesting. I was complaining to the support crew (Evan, Kyle and Glen) about how the softness of hotel pillows generally leaves me feeling restless and sore. Rong’s response was “Oh what a baby, she needs her own pillow.” I could tell right off the bat it was going to be a fun three days, in all seriousness. I have to admit, I was nervous about having to ride 96 miles that day following a slightly tortuous 103 miles the day before. But when Glen checked my tires he immediately realized I was riding at 60psi the entire first day as opposed to the 120psi my tires could handle. Woops. And let me tell you – a little bit of air makes a huge difference! Due to the fact I was scheduled to ride 350 miles total through three states (MO, IL and WI), many people asked me if I was an avid rider. My response? I bought my first road bike when I signed up for the ride in May. Relatively speaking I was close to knowing nothing about my bike, and for this (among other reasons) the Breakthrough Ride support crew was a Godsend. That first day Rong and I began our 96-mile trek from Springfield, IL towards Peru, IL. It was cool and nice until around 11:30 or so, when the hot sun and little hills kicked in. I was under the impression Illinois was flat! After a lunch break in front of a cute little church with a very friendly congregation (it was Sunday afterall), Rong and I convinced ourselves that the worst of our hills were behind us, only to be faced with a monster of a hill a half-mile down the road. I admit, it must have been harder for Rong with his crazy folding bike to climb that hill than it was for me with my road bike. Best advice for future riders: don’t bother studying the elevation map. It’s best to keep it a surprise. I met my other mortal enemy at the end of Day 1 for the last 3 miles or so: WIND! Needless to say, I couldn’t wait to be done for the day, and the feeling of accomplishment when I reached the end could not be topped. It felt good to temporarily trade in my pipette for a bike. I treated myself to some fried pickles and a chicken salad stuffed tomato at a local restaurant called Cabin Fever and headed to the hotel Jacuzzi to prepare my muscles for the next day. Today Rong and I rode from Peru, IL to Freeport, IL (home of the Freeport Pretzels) – a total of 83 miles. After completing nearly 200 miles in the past 2 days this seemed like nothing! When I was training for the ride I imagined I would experience more and more muscle fatigue with each passing day. But strangely I could feel myself riding stronger with time. Luckily, Rong rode behind me the entire time and gave me tips on my form. I will also be forever indebted to Rong for all the beautiful photos he took on the road to capture our journey. He literally attached his camera to his helmet strap and snapped pictures along the way! Melanie joined us with her support van at this point to give Evan a break, and she found Rong’s camera setup to be hilarious. On this day I opted for a different riding jersey – one that all my wonderful friends/supporters signed before I left for the ride. Their words of inspiration carried me through the day. I also began to view the RV (or the “Pony”) as some sort of drug. It was such a wonderful feeling to see the Pony after a rough 20-mile stretch, and I began to depend on that feeling to break up the monotony of the ride. I mean, corn and soybeans are great and all, but exactly how many fields are there? We did meet a body of water for the first time on our journey this day, and this excited Rong to no end, so we stopped and took plenty of pictures (although we never figured out what body of water it was exactly). Our average speed increased by at least 3mph on this day and we were in Freeport by 2:15. This is when things began to get interesting. We checked into the Freeport Super 8 Motel (which, by the way, was supposed to be a Holiday Inn Express) and I was assigned to room 115. We all agreed to meet in the lobby for dinner at 5:00. Lucky for me, Footloose was on TV in the meantime. I was slightly annoyed by the footsteps stomping back and forth in the room above me, but I managed to drown them out with the TV. I was ready and in the lobby by 5:05, and because I’m chronically 5-10 minutes late, I didn’t regard this as a big deal. There was no one, however, in the lobby so after waiting for 5 minutes I figured we were meeting later and I simply got the time wrong. When I walked back out at 5:30 both Kyle and Rong were waiting patiently. Apparently they were waiting there since 5:00, so they say. Weird. After a lovely Italian dinner at Mama Cimino’s Pizza, we returned back to the hotel. The footsteps continued to be bothersome and I was beginning to think something strange was going on. I fell asleep feeling a tad apprehensive about my environment yet excited for the final day of my journey. I began to dream about something coming through my window at me, and I woke up gasping, in a cold sweat, trembling from head to toe, and standing up alongside my bed. And then I saw it – the bedside lamp (on the opposite side of the bed) had been smashed in the middle of the bed! I am not generally a superstitious person, but I firmly believe a ghost wanted me out of room 115. I promptly packed up my things and complied by switching rooms. As I was leaving I could still hear the footsteps moving back and forth above me. We met downstairs for breakfast the next day and I animatedly told everyone about the last night’s adventure. Amidst my excitement I was hit by bad news. Melanie informed us we had to get to the signing event by 12:30 that day – covering nearly 70 miles plus breaks. It seemed like a tough feat to take on, yet quite doable considering the average speed Rong and I had gotten up to on our bikes. Shortly after departing the haunted Super 8 Motel, we crossed the border to Wisconsin and were instantly met with the real hills. They were beautiful large rolling hills that made the hills previously encountered look like small bumps in the road. The humidity was ridiculously intense too! Rong actually shorted out his camera that was attached to his helmet (don’t tell his wife). SO unfortunate because the scenery in the southwest corner of Wisconsin is absolutely breathtaking. As we rolled along, I began to think we wouldn’t make it in time. After the first rest stop where Melanie filled my tires and I posed for a picture next to a sign advertising “Wisconsin Fresh Cheese,” I began to see an end in sight. I thought about my whole journey and how much the Alzheimer’s Breakthrough Act means to my family and tears began to well up in my eyes as I rode up and down the hills (not exactly safe, I know). A sense of adenine began to take over like none I’ve felt before and I actually felt lifted up the hills with strength that was not exactly mine. Rong managed to keep up with his folding bike and only complained a little. We were making great time! We reached the last rest stop 12 miles away from the Capital Building in Madison, where the signing event was to be held. We stopped at a nursery that was apparently the home-sweet-home to thousands of evil mosquitoes. Adequate rest was not possible while being eaten alive, and as Rong commented, “She is obviously not a country girl,” we were on our way towards the capital. We were a few miles away and I was thoroughly exhausted. And then I saw it. Quite possibly the most beautiful sight ever: The Golden Arches. I decided then and there that if Melanie pulled into the McDonald’s, I would be forever indebted to her. Well she not only pulled into the lot and parked the van, she also bought me a large fry and a caramel frappé. Now I am not the biggest fan of fast food chains, but the caramel frappé has changed my life, and the one I drank that day 3 miles away from the finish line was like no other. After convincing Rong to try a french fry dipped in sweet-n-sour sauce (he was a fan! ), we were back on the road. 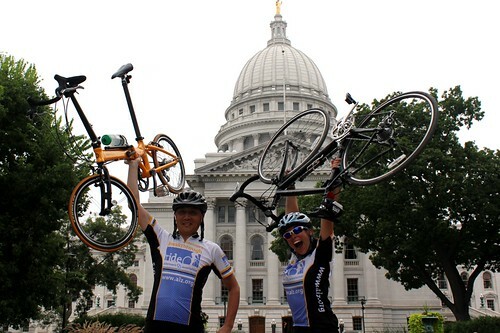 We biked the final 3 miles on the bike lanes of Madison, WI, and reached the Capital Building in no time. We rode up the sidewalk amidst the cheering onlookers and TV cameras and I prayed I wouldn’t fall off my bike. There we met riders Michele Ries and Barbara Bendlin who would be heading towards Chicago the following day. After posing for photos and listening to some rousing speeches concerning the great need for Alzheimer’s research funding, there was suddenly an interruption in the program. A woman from the crowd began to adamantly thank the riders with much enthusiasm. With everyone’s attention on her, she went to the microphone and explained with tears in her eyes that she was just diagnosed with a form of dementia, and her husband counted down the days for her so she could come to the signing event and thank us in person. Trying to control my own tears, I hugged her. It was the ultimate reminder of why we researchers are participating in the Alzheimer’s Breakthrough Ride. Please Congress consider the Alzheimer’s Breakthrough Act as an upmost priority, it is absolutely critical to the future of our society. I would like to send a huge thanks to my wonderful parents, Nancy and Anthony Soscia, who have provided so much love and support over the years, and were the principal motivation for this endeavor. I will never stop fighting for you. Big thanks to my amazing friends and family whose support I appreciated with every single pedal stroke. Much thanks also Cindy Lemere, Sarah Matousek, Oliver Holmes, and Rong Wong for being such fun riding buddies! And especial thanks to my lovely boyfriend Mark, who gave me a pair of custom-made Oakley sunglasses for the ride, with “Breakthrough AD” etched on the lens.